Deletion of the two-door coupe body style and addition of new options packages to the carried-over four-door sedan and a revised grille and wheels for the returning hatchback. This is another course-correction for a feature-rich compact-car line that just received a substantial freshening for model-year 2014. The coupe and the hatchback, which is called the GT, were added for 2013. But the coupe evidently lost its battle for young, single buyers to the automaker’s more radical Veloster. Interestingly, you can still get all three body styles over at Kia, this South Korean automaker’s corporate cousin. Its Forte shares an underskin design with Elantra sedan and features a four-door, a hatchback called the Forte5, and a coupe marketed as the Koup. On the chance this aggressive carmaker would add or subtract something that might interest you. Rumors circulate that the sporty-leaning hatchback might be a candidate for the Veloster Turbo’s 201-horsepower four-cylinder engine. We suppose a return of the coupe isn’t out of the question, perhaps re-imagined for a new demographic. In any event, don’t expect major changes to the sedan or GT for several years. If you’re attracted to a sedan or a hatch that emphasizes high-fashion design and a value equation strong enough to pressure the competition. The sedan is among the roomier cars in the class and wears the new front and rear fascias and the more intuitive dashboard-control scheme that came on line for model-year ’14. The ’15 extends its value story with new option packages that cost hundreds of dollars less than their 2014 counterparts. The GT’s freshened appearance locks in its look for at least the next few years. Both are attractive propositions if you prioritize styling and equipment over road manners. The GT drives with more precision than the sedan, but neither matches the class-leading blend of steering precision and composed ride and handling you’ll get in a rival Ford Focus, Mazda 3, or Volkswagen Golf and Jetta. Only for the GT, and then only subtly. The sedan returns with the “fluidic sculpture” design themes that shook up the compact category upon its model-year 2011 unveiling. The ’14 facelift only enhanced a car that still looks cutting-edge and backs it up with a cabin among the most spacious and comfortable in the competitive set. It returns in base SE, dressier Limited, and livelier Sport models. Among this year’s styling-influencing additions is the SE Style Package with LED-accented headlamps, chrome beltline moldings, and aluminum-trimmed front-door sills, like the Limited and Sport have. New shades of silver, blue, and gray join exterior color choices. The GT comes in one trim level and bears a family resemblance to the sedan but has a different body and more cargo volume: 23 cubic feet behind the rear seat and 51 with it folded versus the sedan’s still-generous 14.8-cubic-foot trunk. The hatchback is less popular than the sedan but its freshened appearance brings appearance of the two more in line. The GT also gets restyled 16- and 17-inch alloy wheels for 2015. None to the returning models. 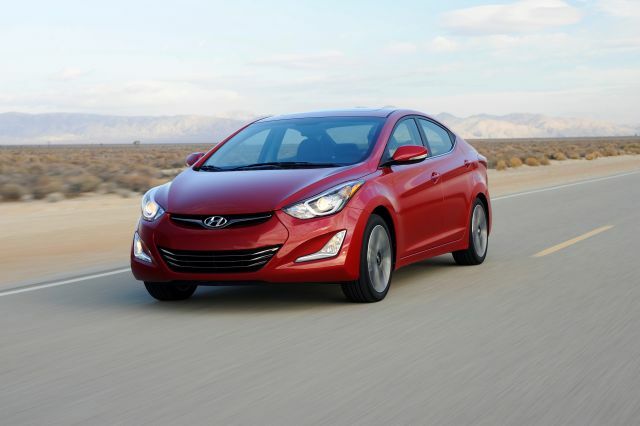 All Elantras hew to the compact-car tradition of front-wheel drive and four-cylinder engines. SE and Limited continue with a 145-horsepower 1.8-liter. The Sport and GT use a 173-horsepower 2.0-liter. Both engines provide good but not inspiring acceleration, although their transmissions have emerged as fine examples of the type. A six-speed manual is standard on the SE and GT. A six-speed automatic is optional on those models and standard on the Limited. Note that the hatchback is based not on the sedan platform but on a different, overseas-market Hyundai architecture. It rides a 2 inch-shorter wheelbase (distance between front and rear axles) than the sedan and its suspension is tuned for tighter handling. Still, both use a cost-cutting torsion-beam rear axle. It’s a less sophisticated setup than the independent rear suspension systems that distinguish better-mannered cars like the aforementioned rivals, as well as the Honda Civic. EPA fuel-economy estimates are unchanged for the sedan. The GT’s 2015 ratings were unavailable in time for this report but without mechanical changes should also repeat. The SE sedan rates 27/37/31 mpg city/highway/combined with the manual transmission and 28/38/32 with the automatic. The slightly heavier Limited sedan, which pairs that 1.8-liter engine with the automatic transmission, incurs a small penalty, at 27/37/31 mpg. With their 2.0-liter engine, the sedan Sport and the GT rate 24/34/28 with manual transmission. With the automatic, the Sport is at 24/35/28 mpg and the hatchback at 24/33/27. Not so much new as rearranged to form more attractive options packages. Sedan and hatchback come with the same relatively generous array of standard equipment, including air conditioning, power windows/locks/mirrors, tilt/telescope steering wheel, cruise control, alloy wheels, USB iPod and auxiliary-port connections, SiriusXM satellite radio, and remote keyless entry. 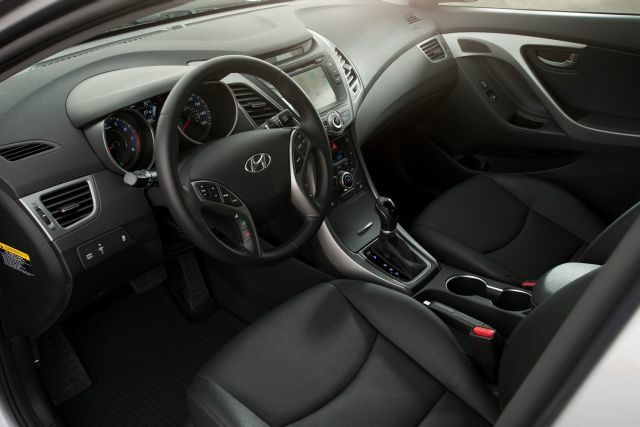 Among features optional on the SE but standard on the other Elantras is Bluetooth hands-free cellphone connectivity with steering-wheel controls, heated front seats, automatic on-off headlamps, fog lights, sunvisors with extensions and illuminated vanity mirrors, and a sliding armrest for the front center console. Leather upholstery is standard on the Limited and Sport and optional on the GT. Factory options are limited to packages and most of the change takes place on the sedan side. A navigation system with a 7-inch touchscreen returns as an option on the Limited but is newly available as part of a Tech Package for automatic-transmission Sport models. In addition to the aforementioned kit, the SE Style Package groups a power tilt and sliding sunroof and a leather-wrapped steering wheel and shift knob. Hyundai says the $750 package saves $400 compared to a 2014 SE with the same equipment. But to qualify for the Style Package you must also order automatic transmission and the $900 SE Popular Equipment Package, which replaces the standard 15-inch wheels with 16s, and includes Bluetooth, a rearview backup camera that displays on a 4.3-inch dashboard touchscreen, and other features standard on the Limited and Sport. Also new is the Limited model’s encompassing $2,400 Ultimate Package. It replaces last year’s similarly configured Tech Package, but at a savings of $350. Again standard or optional, depending on the model and option package is the brand’s BlueLink telematics system. It includes a range of security services performed remotely by live operators, including engine start, door unlock, stolen-vehicle recovery, automatic collision notification, and a mobile-phone app that helps you locate your parked car. Pushbutton ignition is exclusive to the Limited and so are standard heated rear seats, which are fairly rare in this class. Among notable GT options is a package includes unique 18-inch wheels and exterior trim, a sport suspension, and leather seating surfaces. Base prices increase modestly, between $50-$100 for the sedans, and you can expect roughly the same for the hatchback. Base prices here don’t include options but do include the manufacturer’s destination fee, in this case an $810 tariff unchanged from model-year 2014. The ’15 SE starts at $17,910 with manual transmission and $18,910 with automatic. The Limited is priced from $22,460, including the automatic transmission. Sports have a base price of $22,510 with manual and $23,510 with automatic. Estimated base price for the ’15 GT is $19,660 with manual transmission and $20,660 with automatic. The sedan went on sale in June 2014 and the hatchback follows in autumn ’14. Hyundai’s warranty coverage continues among the best in the business, at least among mainstream car brands. 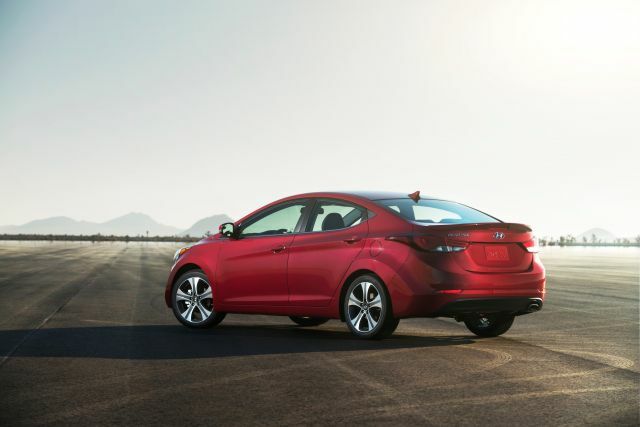 All Elantras have a standard limited warranty that runs for 5 years/60,000 miles (whichever comes first) along with 5 years of roadside assistance. Certain drivetrain components are covered for 10 years or 100,000 miles.